£100 non refundable deposit secures holiday. Full cost plus £50 security bond to be paid minimum 6 weeks before start of holiday. Terms & conditions will be sent via email with booking form. Facility passes are NOT included in price but these can be purchased from reception. If booking for 7 nights or longer a discount will be given against the cost of the published short break prices so please ask for price. Top of the range BK Bluebird Sherborne. This caravan won the holiday home of the year award 2010 & 2011. it is sited at Cayton Bay Holiday Park 4 miles south of Scarborough/ 4 miles north of Filey. sleeps up to 6 people. Caravan has double glazing & gas central heating which is ideal for early & late season holidays. We use the caravan ourselves whenever work commitments allow so it is maintained to a very high standard. Situated on a quite area of the park (Pines, named after the pine trees which surround this area) with own parking space and large wrap around veranda with plenty of seating it is ideal for dining alfresco and gets sun all day, weather permitting. On entering caravan you are welcomed by the large homely open plan living/dining/kitchen area with integrated large fridge/freezer & microwave. In the kitchen there is a gas hob with extractor fan, gas oven & separate grill, kettle, toaster, halogen oven, slow cooker, sandwich toaster/grill, plenty of cooking utensils, pans & crockery. On your left is a freestanding dining table & 4 chairs. The caravan is unusual as there is a step down into the lounge from the dining room. Here you will find a comfy corner sofa, with lots of cosy cushions, which contains the sofa bed, a 42" flat screen TV with choice of HD Freeview or HD Freesat with recording function, DVD player, CD/ DAB radio, coffee table and pouffe. A log effect electric fire can be used for effect only or to provide some welcome warmth on those chilly autum evenings. In the drawers you will find DVDs, games and a file containing local information. 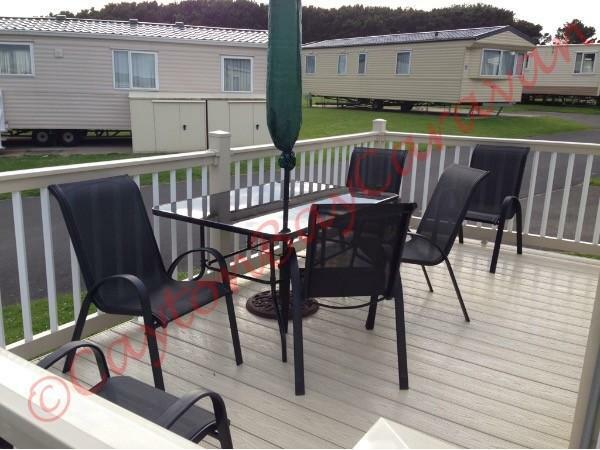 Double doors at front of the lounge open onto the large wrap around veranda where you will find a large table & 6 sturdy chairs ideal for dining alfresco, round to the side of caravan is a matching tete a tete ideal for morning coffee. 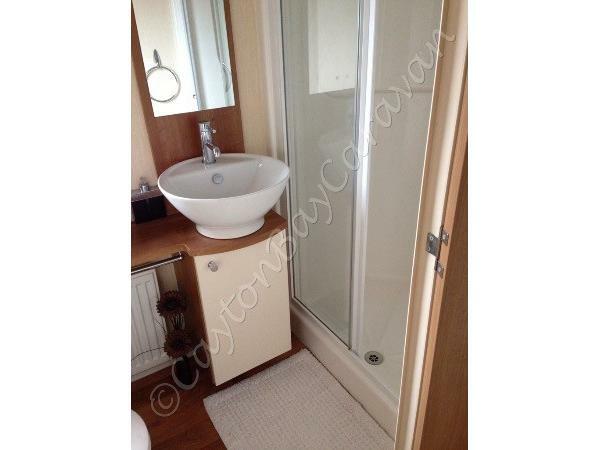 Through the door from the kitchen is a large shower room, a twin bedroom & a king size master bedroom with ensuite. 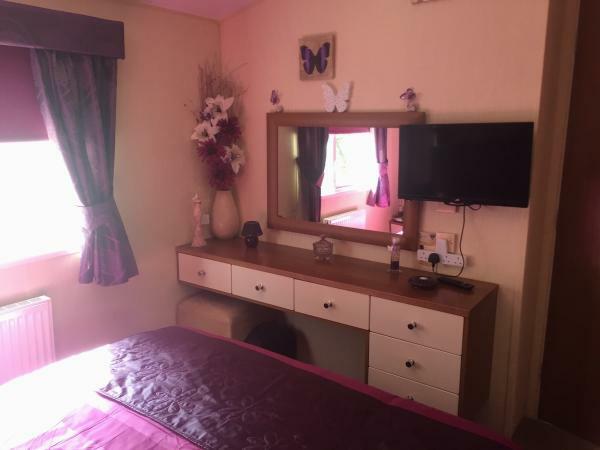 Master bedroom has large sliding wardrobe with a full length mirror, large dressing table with mirror over, plenty of drawers to place all your bits & bobs, bedside cabinets, overbed/bedside lights, on the wall is a flat screen TV/DVD, there is also room for a small travel cot. Twin room has 2 single beds, wardrobe, drawers, bedside chest, lamp & wall mounted 19" LCD TV/DVD. This is a real home from home caravan with many extras you will not get when you book through Park Resorts. It is extremely well kept and used regularly by ourselves. We are sure you will not be disappointed however we cannot guarantee the weather. Available for hire for short breaks or longer throughout the whole year, don't miss out book today only £100 deposit. We would like to thank Shelia for the hire of your caravan. We all had a very nice holiday and the caravan was outstanding, beds were very comfortable. I will definitely book this caravan again and would highly recommend this caravan to family and friends. So once again I thank you. Very comfortable and homely caravan on very nice area of park. Well equipped and very clean. Would recommend. After having stayed in a different caravan located in Pines for the last 2 years, we fancied a change of caravan but in the same area. So glad we did as this is a beautiful caravan in an amazing location on the park. So quiet on an evening sitting on the balcony with a glass of wine just listening to the birds singing, for the first time in a very long time I felt totally relaxed! Everything inside the van is immaculate, the king size bed is the comfiest I have ever slept in and our daughter said the same about the single bed too.The lounge area is spacious and well laid out and has a decent sized TV for cosy nights in watching DVD's. The kitchen and all facilities are well designed and are really like home from home. The balconies are lovely and the little side by side chair and table on the side balcony is a really nice touch. All in all I would highly recommend this caravan, particularly if you want to enjoy of the facilities at Cayton Bay but prefer the peace and quiet on an evening and into the night. My little girl is already asking when can we come back! Thank you from Chris, Sammi and Ruby. Glad you enjoyed where the caravan is situated. I also find it so peaceful and relaxing sitting in the veranda. Nice to hear you got some good weather. Exceptionally high standard of accommodation. Could find no fault with anything at all & cannot recommend highly enough. Grandsons loved the games & their bedroom. The whole caravan was very clean & lovely and cozy at night. Do not hesitate to book if you can find a slot as very popular. Booked this caravan for my parents and they were absolutely delighted with every aspect of it, the caravan was of a very high stanard and the owners have thought of everything to ensure a home from home environment, it is in a lovely quiet location but within easy walking distance to all the onsite amenities. Communication with the owners was excellent, they should be very proud, would highly recommend. This caravan was the best we have stayed in (and we've stayed in a few). Very clean, comfy and everything we needed. The shower was great and very powerful. The owners were on the end of the phone if needed but we had no problems whatsoever. My youngest daughter loved the fact there were board games supplied and we all enjoyed those. I would recommend this caravan to anyone looking to hire one in Cayton Bay and we would not hesitate to go back. 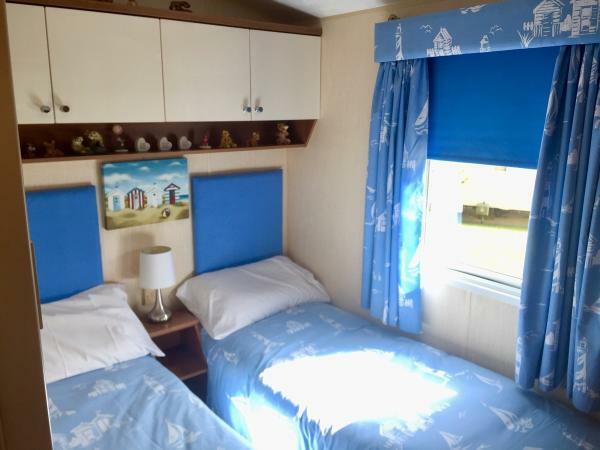 Beautiful caravan,spotlessly clean and tidy, has everything you need,nice big TV to watch, brilliant shower with great water pressure and the bed is the best we have ever slept in in a caravan, no springs just a proper memory foam mattress. Lovely quite area of the park, never heard any noise at all except for the birds singing. You wont go wrong if you book this caravan. Thank You Sheila.